From a distance, Exit Glacier appears as a river of white and blue flowing down through the mountains toward lower terrain. In fact, it’s just the opposite. The 2-mile-long chock of solid ice has been retreating at a faster and faster pace in recent years, more than 800 feet since 2008, satellite tracking shows. ‘‘This is as good of a signpost of what we’re dealing with when it comes to climate change as just about anything,’’ Obama said with the iconic glacier at his back. Obama trekked up to the glacier with photographers in tow in a carefully choreographed excursion aimed at calling attention to the ways that human activity is degrading cherished natural wonders. 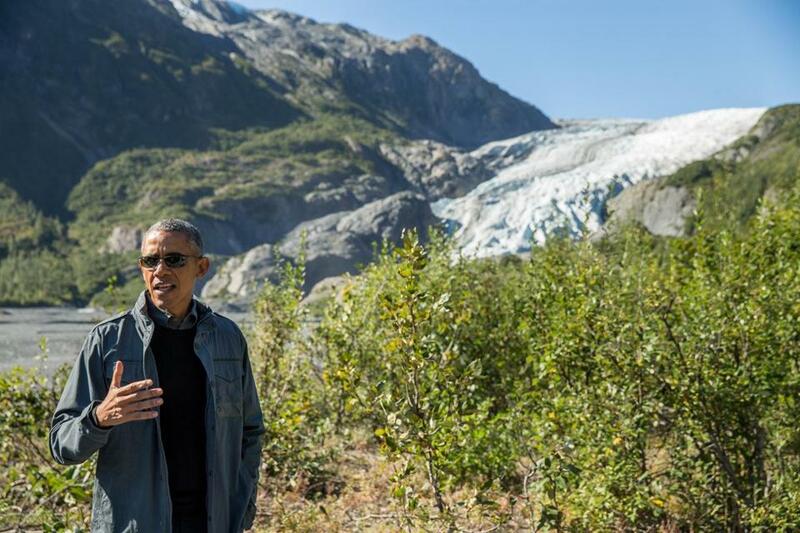 The visit to Kenai Fjords National Park, where the glacier is located, formed the apex of Obama’s three-day tour of Alaska, his most concerted campaign yet on climate change. The president, dressed for the elements in a rugged coat and sunglasses, observed how signposts along the hike recorded where the glacier once stood and now only dry land remains. Meanwhile, Obama proposed speeding the acquisition and building of new Coast Guard icebreakers that can operate year-round in the nation’s polar regions, part of an effort to close the gap between the United States and other nations, especially Russia, in a global competition to gain a foothold in the rapidly changing Arctic. The president’s proposal, which came on the second day of a three-day trip to Alaska to highlight the consequences of climate change and call for a worldwide effort to address the issue, touches on one of its most profound effects. The retreat of Arctic sea ice has created opportunities for shipping, tourism, mineral exploration, and fishing, but the rush of marine traffic that has followed is bringing new difficulties. Obama is counting on Alaska’s exquisite but deteriorating landscape to elicit a sense of urgency for his call to action on climate change. He opened the trip on Monday night with a speech painting a doomsday scenario for the world without urgent steps to cut emissions: entire nations submerged underwater, cities abandoned, and refugees fleeing in droves as conflict breaks out across the globe. Glaciers ebb and flow due to normal fluctuations in the climate, and even without human activity, Exit Glacier would be retreating. But the pace of its retreat has been sped up thanks to heat-trapping greenhouse gases blamed for global warming, said Deborah Kurtz of the National Park Service. ‘‘Climate is the primary driver for the retreat of glaciers and for ice loss,’’ Kurtz said. Obama’s trip was more about visuals than words, and the White House has put a particular emphasis on trying to get the message across to audiences who don’t follow the news through traditional means. To that end, Obama planned to tape an episode of the NBC reality TV show ‘‘Running Wild with Bear Grylls,’’ putting his survival skills to the test while in the national park. He also planned to board a US Coast Guard vessel to tour the park by boat before returning to Anchorage later Tuesday.